Limited stock of the 5-piece package also available. Your family is guaranteed to enjoy Conrad Grebel’s Huntington dining set for generations. Amish and Mennonite craftsmen in Goshen, Indiana make each piece by hand utilizing time-honored techniques and fine solid maple wood. 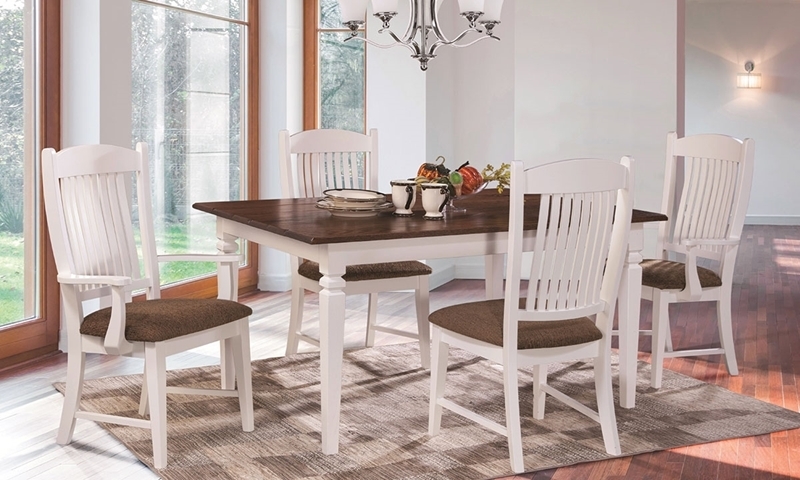 The 60-inch farmhouse-style table comes accompanied by four ladder back side chairs and two arm chairs, providing comfortable seating for six. A protective varnish over the American antique hand-finish completely shields the wood from everyday spills and accidents. Art for illustration: Package includes ladder back style chairs, and is currently available in solid maple in an American Antique finish.